Before I make a decision, I ask this question – What else do I need to know? What else do I need to know, before I make this decision? What else do I need to know, that if I don’t know, may come back to destroy the decision? What else do I need to know, that would cause me to make a different decision? What else do I need to know, that would cause someone else to make a different decision? What else do I need to know, that I don’t know I need to know? I am not looking for analysis paralysis, but I am looking for a gut-check on my intuition. This entry was posted in Business Intelligence, Decision Making and tagged analysis, decison making on April 18, 2018 by Tom Foster. You talk about work as making decisions and solving problems. You talk about discretionary judgment. When I tell a team member about their role (in a role description), it seems more like a list of tasks that have to be completed. How do I talk about discretionary judgment in a role description? Most role descriptions are as you describe, a disorganized list of tasks and activities. But, when we hire a team member, we are not paying for their tasks and activities, we are paying for their discretionary judgment. If we were just paying for task completion, we would hire robots. And, every role has decisions to make and problems to solve. Every role requires discretionary judgment. A typical supervisor task is to post a work schedule for the team for the following week. But that is just the outcome. Here is the discretionary judgment part. This task requires the supervisor to look ahead on a rolling 4-6 week basis, to anticipate changes due to team member vacations or other circumstances that will affect the team member’s attendance. And to look ahead on a rolling 4-6 week basis, to anticipate changes due to production fluctuations which may require a reduction in shift personnel or overtime. The supervisor will use discretionary judgment to create the schedule based on those circumstances. This entry was posted in Decision Making and tagged decision making, discretionary judgment, problem solving on March 6, 2017 by Tom Foster. From Monday’s post A More Accurate Judgement of Capability, the question came – So how does one get into the judgement business? Become a manager. Don’t give me politically correct rhetoric that we shouldn’t judge. Management is all about judgement. Work is making decisions and solving problems. Making decisions is all about judgement. Elliott called it discretionary judgement. What has to be done next? Who, on the team, would be the most effective at completing this task or that task? How effective was the team member, completing this task or that task? This entry was posted in Accountability, Decision Making and tagged accountability, decision making, judgement on January 25, 2017 by Tom Foster. I was just promoted to a new role in my company, as an S-III manager. Every working relationship is now different. All these years, I avoided my manager because the only feedback I got was criticism, my task assignments seemed like barked orders. The less we talked, the better we got along, at least from my perspective. As time went by, my manager moved on and I was tapped to take his place. So, now, I have a new manager. In your workshop, you said it is the role of every manager to bring value to the decision making and problem solving of each team member. While this is certainly advice for me as I work with my new team, I am more curious how I might kickstart things with my new manager. I refuse to stand by the same dysfunction I had with my old manager. How can I get the most out of the working relationship with my new manager? First, congratulations on your promotion. I can see from your question why your company selected you. I assume your new manager is in a role at S-IV. The central document to clarify expectations is a role description. The tendency is to assume understanding without a written agreement. Write it down. In your new role, you will be accountable for a range of outputs. An S-III role is a big role. You will have a long list of tasks and activities. Some of the things you do will go together, but some things will be separate and distinct from the other tasks and activities. All are important, none can be overlooked. Find the things that go together and collect them (in the role description) into a Key Area, a Key Result Area (KRA). Go back to your list and find the next things that go together, separate and distinct from the other tasks and activities. Collect them (in the role description) into another KRA. By the time you finish this exercise, you should have defined approximately 6-8 KRAs. In each KRA, based on the tasks and activities, define the output. What is the accountability in each KRA? Each Key Area must have at least one, no more than three defined outputs. Schedule a recurring meeting with your manager, two hours, once per month. This meeting is just the two of you, 1-1. This is not a casual meeting, but a formal meeting with a start time and an end time. You set the agenda. Your agenda will follow the Key Result Areas (KRAs) you defined. Your role description will give you a general idea of the tasks and activities, as well as the defined output in each KRA. Your agenda will identify the specific actions and short term goals for the next thirty days. In the meeting, as you describe your intentions to your manager, you will make notes and commitments. There will always be something that seems more important at the appointed time of your meeting, but it’s not. The event that gets in the way of your meeting will be more urgent, but never more important. This entry was posted in Decision Making, Performance Feedback and tagged coaching, decision making, problem solving on December 12, 2016 by Tom Foster. I have a member of my team that works hard and handles day to day tasks well, but, when his plate gets a little too full, I often don’t find out about it until after an issue happens with a client. I do my best to stay on top of his task list and he knows he can always ask me for help, he just doesn’t. Every client has different times where they are busy and times they are quiet so I need my team to let me know when they need additional resources to hit their deadlines. I think not-asking for help is a mixture of pride and a lack of foresight to see trouble coming. As his manager, how can I help make this situation better (without looking over his shoulder all day, every day)? Little problems, allowed to fester, become big problems. And, as the manager, you would have fixed the little problem (when it was easy to fix) if you had only known. The team member’s recognition the problem exists. The team member’s understanding where to go for help. The team member’s mindset (belief) about the problem and the channels for help. As the manager, given the same circumstance, you would have recognized the problem or at least the potential for a problem. Your team member may not see what you see, yet, you rely on your team member to spot the trouble. Spend time with your team, in general discussion, on problem identification. You can start with debriefs of completed projects. How did we find out what went wrong? How can we recognize something-going-wrong next time? When we recognize something-going-wrong, what can we do about it? Next move to existing projects and ask the same questions. What do we expect in this current project? What do we do well, what are our strengths? How will we find out something is about to go wrong? How will we recognize something is about to go wrong? When we recognize something about to go wrong, what can we do to prevent it? These debrief meetings lead into project status meetings. A project going OKAY doesn’t really tell us much. Create some sort of shorthand or code that describes specific states of projects. You can use project stages, color codes, alphabet codes. You pick. Most importantly, identify the code level when the decision is in the hands of the team member and the code level when the decision needs to surface to the manager. I am suggesting a formal structure that guides your team to ask for help. As the manager, you are currently trusting the team member to make a decision without context. Create a context that provides specific guidelines about when and how to ask for help. Your team can (and will) help you create this context as part of the project debriefs. Culture is a set of beliefs that provide context for behavior. Without context, the team member will create their own context, which can be misguided to the purpose of the project. Most team members do not think about the future implications of problems allowed to fester. Here are some questions to structure what we believe about the future of the problem. If nothing is done, what will happen in a day? If nothing is done, what will happen in a week? If nothing is done, what will happen in a month? If nothing is done, what will happen in a year? Ask your team to collectively imagine into the future. It is a powerful way for a manager to get in touch with current mindsets and create a context to anticipate and prevent problems in the future. Change the context, behavior follows. This entry was posted in Accountability, Decision Making and tagged culture, manager, problem recognition on February 24, 2016 by Tom Foster. And If the Advice is Wrong? “So, what happened?” Jim wanted to know. “It doesn’t matter what happened,” Mary said. “What matters is that it was my decision and my decision alone. I was accountable for the decision and the consequences of the decision. The technical crew did their best to keep the aircraft in pristine working order. Flight operations did their best to keep the customers on schedule. “What if the technical advice you get from your team is wrong?” Jim pressed. This entry was posted in Accountability, Decision Making and tagged accountability, decision making, Outbound Air on May 21, 2015 by Tom Foster. “I have an issue where I could use your help,” Jim explained to the group. “And I think your understanding will have impact all the way to the top of this organization. 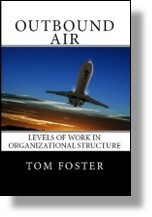 This entry was posted in Decision Making, Organization Structure and tagged decision making, organizational structure, Outbound Air on May 20, 2015 by Tom Foster. Who Appointed You to Make That Decision? “It’s not their role to make a decision like that?” Javier replied. “And, who appointed you to make that decision?” Catherine continued to press. This entry was posted in Decision Making, Organization Structure and tagged level of work, manager, supervisor on May 15, 2015 by Tom Foster. Catherine stopped to let this sink in, before she continued. “And, why not. The routes are unprofitable, why shouldn’t your shift supervisors cancel those flights?” Catherine challenged. This entry was posted in Accountability, Decision Making and tagged accountability, decision making, manager, role of the manager on May 14, 2015 by Tom Foster.